Vehicles with a trailer tow hitch: if possible, connect the towbar to the trailer tow hitch . The brackets for the screw-in towing eyes are located in the bumpers. They are at the front and at the rear, under the covers. ■ Remove the towing eye from the vehicle tool kit . ■ To open the cover at the front: press the mark on cover 1 inwards in the direction of the arrow. ■ To open the cover at the rear: insert a flat, blunt object into the cutout and lever cover 2 out of the bumper. ■ Take cover 1 or 2 off the opening. ■ Screw the towing eye in clockwise to the stop and tighten it. ■ Loosen the towing eye and unscrew it. 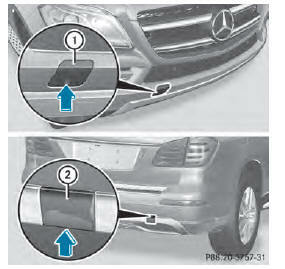 ■ Attach cover 1 or 2 to the bumper and press until it engages. ■ Place the towing eye in the vehicle tool kit.